And I thought about it. That’s true. I don’t let negative people in my inner circle. You can be as cool as hell is hot, but if you are a Debbie Downer, Negative Nancy (no offense Nancy ), or one who constantly criticizes others, we will never be close. That’s just a MAJOR turnoff for me. 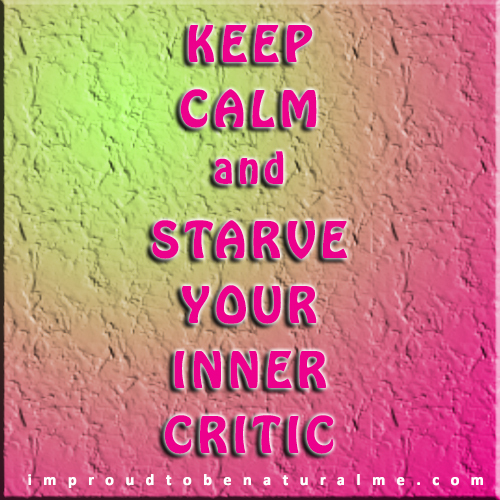 So I’m breaking up my inner critic. She’s not my friend. She doesn’t deserve all the time and attention she gets. She has no right to even speak to me. She’s mean. She doesn’t even like me. She never has anything nice to say. No matter what I do right, she always points out the one thing I did wrong! So it’s over between us. I know she’s not gonna go nicely so….. I’m gonna attempt to starve her to death. She loves attention, so I’m not gonna give her any. When I catch myself listening to her, I’m just gonna stop her mid-sentence, and tell her how awesome I am, and maybe even remind her of what I’ve done RIGHT! Eventually her voice won’t be the loudest one I in my head. Eventually, thoughts of my awesomeness will overshadow her criticism. Eventually, she’ll be nothing more than a faint whisper in the background of my thoughts. The voice I question, rather than automatically accept as truth. This entry was posted in Blog Posts and tagged criticism, frenemies, friendship, inner critic, self esteem, self-acceptance, self-worth, value. Bookmark the permalink.